Here we are giving you this ever golden chance to get to know about stylish and creative ways as to how to wear a plaid scarf! Here we have autumn and it will just be incomplete without wearing a plaid scarf. It is quite crazy, and it can also just goes well your seasonal blue jeans, that must gives a extra look to your outfit: Now number of women makes it a permanent part of outfit that gives a best look to dressings. You can either fold it around your neck, you can make that bow of it, make it in a ribbon form and you can also just hang it around your neck. One just try any of the style you want to have with this scarf! If you will be having that red checkered scarf then you have to wear a black colored outfit. Wear black jeans or tight leggings, with white color shirt and wear scarf with it a black leather jacket. If your scarf is of almond color then you can wear any kind of light and pastel colored top. It can be a knitted top, knitted sweater, yes it can be anything. Yes, this plaid scarf has been marked as one of those timeless fashion pieces that will remain keep on be looking stylish in each and every of the seasons. You can be wearing it to the beach along with your sun dress, you can also fuse it with your plain tee or you can too be wearing this plaid scarf with your knit sweater. We can also say that your styling will not ever and ever go wrong while wearing these checkered fashion scarves! 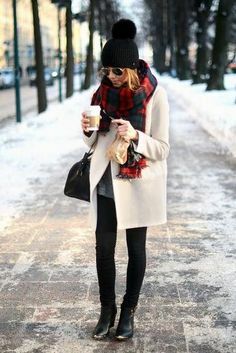 These plaid scarves just look wow with stylish winter coats! Get a plaid wool scarf and it has to be in versatile color base, like that of dark navy blue and browns. These are the colors that can well go with your winter coats. We have seen those reds and purple, orange and also brown scarves will look better on girls who have warm skin tone. If you have cool skin tone then go for pink and blue and also light grey plaid scarves. This is how to wear a plaid scarf! One takes a better idea from this detail with some matching details.